And there should have been “only one”… movie, that is. In 1986, writer Gregory Widen and director Russell Mulcahy introduced the world to something that was very cool and had not been done before. Looking back, this could very well have been one of the first entries into the popular Urban Fantasy genre, where a race of immortal beings fought through time to attain the ultimate power. No I’m not talking about the Vampire Diaries (seriously… have you even read any of my other articles?). I’m talking about the singular movie starring Christopher Lambert and Clancy Brown… the original, ignore the rest (except maybe for the television series), Highlander! I’m not saying this was a perfect movie, but it did some very cool things… The cutaways from present to flashback, the concept of immortals living among us, keeping to themselves as they “struggled to reach the time of the Gathering, when the few who remained would battle to the last”. 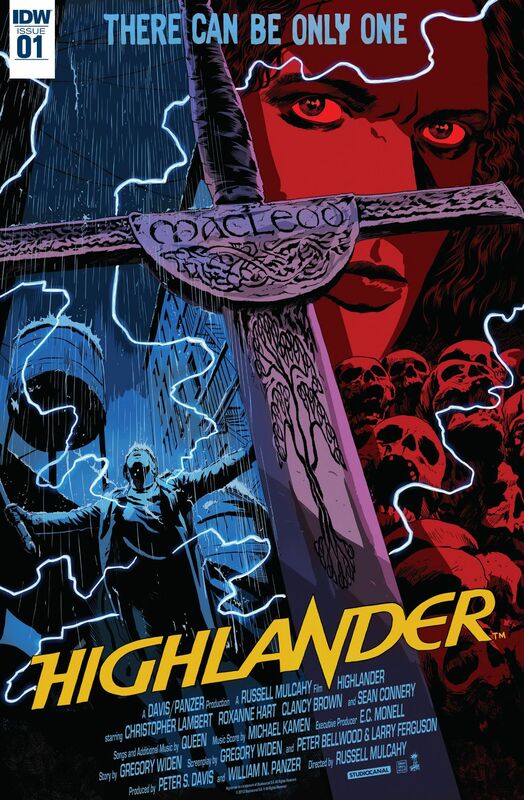 The blending of the modern setting and elements of fantasy hadn’t really been done before, at least not with any degree of success, and the concept of the “eternal champion” (Connor MacLeod of the Clan MacLeod) does have a resonance with audiences as it worked both the action and the emotional angles. So while the swordplay might not hold up to today’s cinematic standards, for the time it really brought out some epic concepts that appealed to a wider range of audiences. Also, I have to mention a most outstanding soundtrack from legendary group Queen. Nope, we’re not gonna talk about that one… Or 3… or 4. They never happened, move along, nothing to see there. Now, I did mention a television series, airing from 1992 to 1998 and starring Adrian Paul as Connor’s clansman Duncan MacLeod (“same Clan, different vintage”). The series broadened the scope of the lore touched on in the movie, and we were introduced to a much wider array of Immortals (even had one played by rocker Joan Jett), all striving to survive long enough to reach the Gathering. The show might have been guilty of some serious retconning, taking place after the original film and ignoring the fact that Connor was actually the last Immortal standing in sort of a soft reboot. Fans forgave that little indiscretion, though, because of what the show brought to the table. The overall tone of the movie was kept beautifully intact, following the Immortal Duncan MacLeod as he lived out his days watching friends age and die, and Adrian Paul brought some actual martial arts training into the role (seven years in various forms of Kung Fu, Tae Kwon Do, Wing Chun, and Kendo). 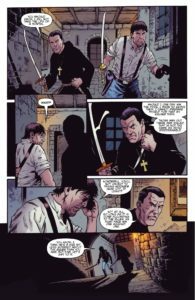 And now IDW Publishing is putting out a series of comics that fans of the Clan MacLeod have been waiting for. 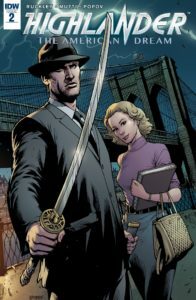 No reboots, hard or soft, but filling in some of the blanks in the life of the original Highlander Connor. Ranging in time from the American Civil War to Manhattan in 1986, with the Gathering looming on the horizon, Connor’s story continues. In modern New York, Connor reunites with fellow Immortal, Osta Vazilek. The two reminisce over old times as Vazilek urges Connor to consider the importance of what’s coming. While many of the Immortal race have all of the best of intentions, there are those who are just out to survive. Worse, there are those who would use the power to be won during the Gathering to recreate themselves as beings of godlike power. 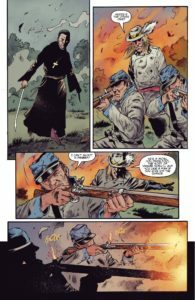 We’ve already been introduced to the Kurgan (portrayed by Clancy Brown in an outstandingly, gleefully evil performance), but there’s also John Hooke, whose viciousness stretches back to the Civil War. Vazilek, a former monk, has decided that it is the responsibility of those of conscience to ensure that people like Hooke do not win The Prize. Brian Ruckley has done a great job of presenting an embittered, emotionally weary Connor MacLeod. He’s seen things, done things, and has made many attempts to find a quiet hole somewhere in the world to live out eternity. But the world always has other plans, and the Highlander is repeatedly dragged back into the game. 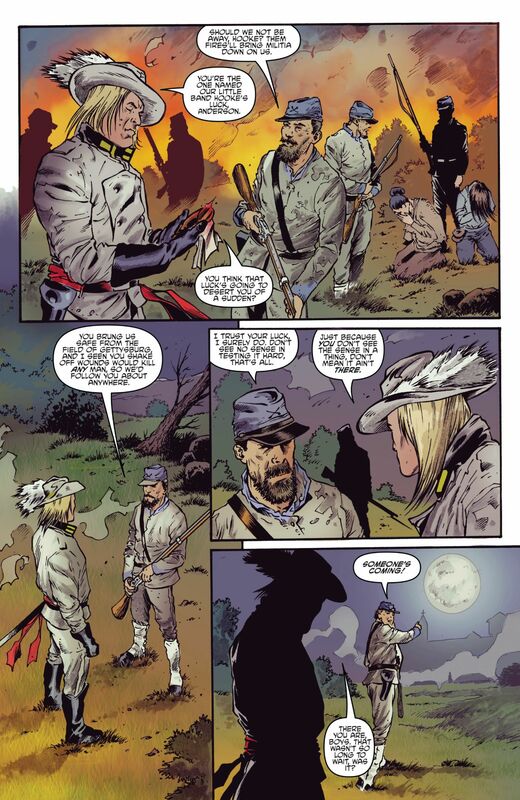 Ruckley brings some focus back to another element of the original film that’s largely been ignored, Connor’s father-figure relationship with Rachel, the girl he rescued during World War II (his older-looking secretary in the movie). These are the humanizing touches that made the movie a cult favorite and keeps it interesting… Let’s face it, a bunch of people who can only be killed by decapitation swinging swords at each other might be cool for a bit, but it wouldn’t really stick in the brainpan for very long if audiences couldn’t find anything about the characters to relate to. The art by Andrea Mutti, along with the colors by Vladimir Popov, leans more toward a realistic style than the typical over the top comic book visuals of bright colors and hyper-developed physiques. In combo, the art and colors do a great job of presenting some solid action sequences. The violence is there, it’s bloody, but where it goes into highly graphic territory it’s left in a silhouette of black and red so as not to push the book into a more mature rating. Watching an immortal monk wade through a hail of musket balls is one thing, but when a man is pistol whipped into a bloody pulp it could get a little iffy (especially with sound effects like “CRACK”, “CRUNCH”, and “CLUMP”). I know that the original fans of the Highlander story are getting up there, and might not all be into the comic book medium… although I personally can’t relate to that prospect at all… but there would hopefully be enough interest to build a good audience for this series. IDW has done a good job of bringing some pretty retro titles back into the limelight, reintroducing them to modern readers, and I don’t see any reason at all that Highlander shouldn’t be the next in line.